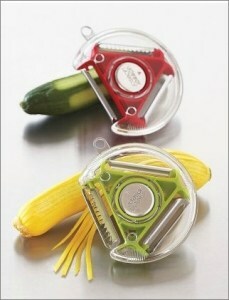 (13) This compact 3-in-1 Peeler ($12 each) has three different stainless-steel blades for three different tasks. The standard blade is perfect for potatoes and carrots; the soft-skin blade can be used on tomatoes and kiwi; and the julienne blade can be used on just about any fruit or vegetable to make thin matchstick strips. The blades can be changed with a simple twist of the dial. Dishwasher-safe.